925 sterling silver lightweight pearls & amethyst beads 18-19 inch necklace. Hand-made in India from 925 silver. The chain is made in sterling silver with a 9ct gold overlay. Each stone and seed pearl is securely held on its own little link. Your jewellery will arrive in a luxury leatherette gift box and gift wrapped. Collection station availableMetal: Yellow Gold PlatedStyle: ChainLength: 18 - 19.99"
There is a knot between each pearl. The necklace could do with a clean (especially the clasp), but I don't know how to clean pearls, so I thought I'd leave that to the new owner! They also feel very nice and warm when worn! Lovely sterling silver necklace with white freshwater pearls and fine sterling silver details throughout. Limited edition piece 1 of 150 pieces. The pendant has a 40mm drop, the pearl is 12 mm in size. There are 6 pieces of Black Spinel in the drop on this pendant all are round and 1.5mm. they weigh 0.06 carats. Sterling Silver Fine Chain 925 with Fresh Water Pearls. Perfect accessory for that special outfit. Length 16" Triple Chain. It is held on a 925 sterling silver linked chain fastened by a springring. The hexagonal shape of the pendant sets off the central pearl. Beautiful 925 stamped genuine silver necklace and bracelet set with a T-bar fastener detail and droplet mother of pearl heart charm. Has never been worn.The necklace is 16" (41 cm)long and the bracelet is 8" (20 cm) long. 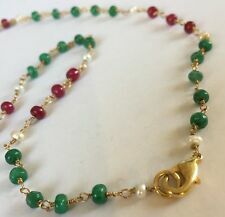 This is a beautiful hand crafted fine necklace with genuine seed pearls and rubies. The chain is made in sterling silver with a 9ct gold overlay. Each ruby or seed pearls is securely held on its own little link. The chain is made in sterling silver. Each stone is securely held on its own little link. Collection station availableMetal: Sterling SilverStyle: ChainLength: 18 - 19.99"
Sterling Silver*chain Ankle Bracelet,angel Wing&pearls/10"+2”ext Chain. On offer; This lovely necklace is from the designer range of Kit Heath. It is in Sterling Silver and has 3 heart clusters hanging at the front with small grey freshwater pearl and small faceted blue topaz beads. The silver hearts have a hammered finish. The necklace can be worn at 16 or 17 inches. It is brand new from my retail shop, supplied boxed and can be gift wrapped at no extra cost if required. Will be sent out by 2nd class recorded post within a couple of days of payment being received. Thank you for looking. Golden Pearl Curb Chain Necklace (Size 28 with Extender) in. WhiteHowlite, Simulated Champagne Diamond and Simulated. Yellow Gold Tone 456.000 Ct. Triple Strand 999 Silver chain made with handmade beads & 999 fine silver charms & Polished gemstones ,Turquoise Red Coral Lapis Lazuli & Pearl. Each piece as a as a weight, bright satin colour, and feel, all of its own. 🌟SALE🌟Pearl Harted Locket&ster Sil 16" Chain&925Bangle HeartWing&star charm. Sterling silver 925 stamped *plt chain 22”approx plus’s 925 Stamped Hooked earings with Sil plt hearts& ruby red gemstone & pearl inside& matching sterling silver *plt bracelet 7.5/8” approx/chain May differ/SEE MY OTHER ITEMS./P&p,were applied,none returnable,/no return no refund,buyer pays all postage. The necklace features beautiful cultured Freshwater pearls at the centre. Bronze and grey cultured freshwater pearls. Beautiful sterling silver pearl necklace. For sale is this rare one-off handmade designer 9 carat gold amber and pearl necklace. Superb design with alternating sections of amber and pearl beads. Bolt ring clasp fitting. Complete with original case. SILVER 925 stamped * plt 16/18”chain APPROX with real cherry quartz gemstone angel& heart silver 925 bracelet 7.5" approx with shell pearl cross&heart sil plt heart charms/Chain May differ,SEE MY OTHER ITEMS./P&p,were applied,none returnable,/no return no refund,buyer pays all postage. 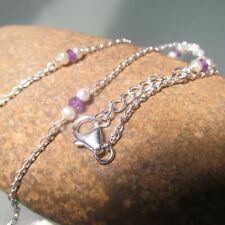 Set Of 2, Anklets 10”+/Sterling Sil*chain&flower Pink Pearl. (Set of 2) Sterling silver *plt chain & pink pearl&acrylic flower anklets 10” 2” ext chain approx///chain may differ///SEE MY OTHER ITEMS/p&p ,were applied,none returnable/ no return,no refund, buyer pays all postage costs. Silver Mother of Pearl Butterfly & Daisy Necklace on a 18" Silver Ball Chain . Catch in Good Condition. Marked 925.Pendant 1". Metal: Fine SilverStyle: ChainLength: 18 - 19.99"
BOXED/First Communion/gift&Card+SterSil 16"" Chain&pearl Bracelet&earings. Rhodium plated silver pendant set with a 8 mm pearl and a cubic zirconia on the bale. Supplied with an 18" chain. Beautifully displayed on a white pad and presented in a lovely blue velveteen gift box. Collection station availableMetal: Rhodium PlatedStyle: ChainLength: 18 - 19.99"
Rhodium plated silver pendant set with a 8 mm pearl surrounded by cubic zirconia's. Supplied with an 18" chain. Beautifully displayed on a white pad and presented in a lovely blue velveteen gift box. Inspired by the clover leaf these 16 double sided mother of pearl motifs are adorned with golden beading. Chain 48″ in length.The hidden clasp allows the necklace to be worn long or double wrapped. In excellent condition this piece dates from 2011. Sterling Silver, Black Onyx & Freshwater Pearl Pendant on Fine Sterling Silver Chain. Ready to wear or Gift. Sterling Silver, Green Onyx & Freshwater Pearl Pendant on Fine Sterling Silver Chain. Ready to wear or Gift. If our available products can then run underneath the above that would be great. We will always go out of our way to source the product you are looking for. There are 3 long strands hanging from the centre - the longest is 20cm. Up to 10 years old. In very good condition - see photos. Necklace featuring a 25mm wide mother of pearl dolphin shaped pendant with a glass bead eye. Mother of Pearl Dolphin Necklace. Collection of goods is not an option under any circumstances. FOR YOUR CONSIDERATION IS THIS PRETTY FAUX PEARL & TURQUOISE GLASS CHAIN NECKLACE. professionally tested and securing with a bolt ring clasp.